Juravenator is a type of small ceelurosaurian dinosaur, which was known to have lived in the Jura Mountains of Germany about 150 million years ago. The term Juravenator was derived from the Greek and the meaning of term is Jura Mountains hunter. The term is pronounced as Joor-ah-ven-ate-or. It is known to have belonged to the Jurassic Era. Juravenator is known to have been two feet (i.e.) 70 cm long. It would have weighed around 300 grams. It was found that the food habit of Juravenator would have included insects and fish. 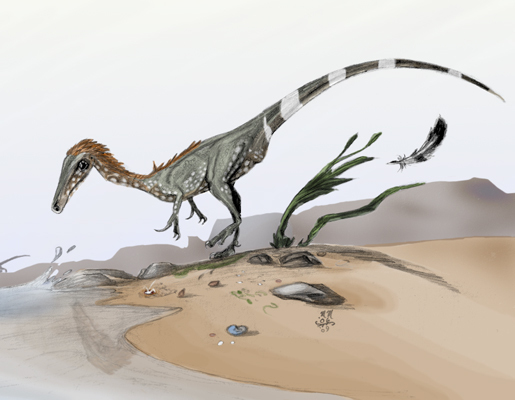 Juravenator was regarded as the member of Compsognathidae family, which makes it a close relative of sinocalliopteryx and sinosauropteryx. The fossil evidence of Juravenator showed that it would have had a downy, feather like covering. But, some parts of fossilized Juravenators' skin demonstrate that it would have been a normal dinosaur without any feathers.